Cute but more importantly short. When you need your Kawaii fix but don't have 22 minutes, this filled the space. Not a lot of plot, but it didn't really need it. The concept might work as a longer series with standard length episodes. I enjoyed it but wasn't expecting anything more then it was. A fun, short watch. I thought this was just a cute little anime. I wasn't overly captivated with it, so it wasn't something I binged. However, when I was looking for something to kill a few minutes while I was cooking or making tea, this was great. My main concern is I feel that it could have been more like a continuing story, instead of broken segments. Cute and funny, if a bit short. Cute girls doing cutesy things. 13 episodes at 3 and a half minutes long. That leaves something to be desired but for a short anime it is still worth the time to watch. It has humor, with most episodes giving a good chuckle or a hearty laugh. Each episode has some random mini plot to them so there is at least something in the way of a story. It is worth giving it a try. At worst you've only wasted 3 minutes rather than 30 on a normal series. The title says it all, really. This short-form is cute, well-drawn and has a few charming (and a few very generic) characters. The storyline is loose but consistent over the season. It's entertaining but nothing special or overly memorable. I like the size of the episodes, though. This anime is meant to be a commercial for a Hakone region hot springs (near the base of Mr. Fuji and an hour away from Tokyo). You will see an assortment of this anime to attract tourists. A lot of visitors have paid homages to particular sites like Toyosato Elementary School (K-ON! ), Dogo Onsen (Spirited Away), Iwami Town in Totori Prefecture (Free! ), Chichibu City in Saitama (Ano-Hana), Saitama (One Punch Man), etc. They are meant to attract more visitors, but I feel that this was just a half-hearted attempt. The story is mediocre (hell one of the characters is named that), the characters are bland and forgettable, and the scenery only held a few interesting sites. Otherwise a very "meh" anime overall. Hakone-chan is one of those seasonal anime shorts with familiar characters and predictable twists. However, It's still enjoyable to watch the antics of Hakone and her friends. If you're looking for a short series with little plot, then this is for you. While I agree that the animation and voice acting are quite good, the series starts off with a plot and story line but then loses both after several episodes. 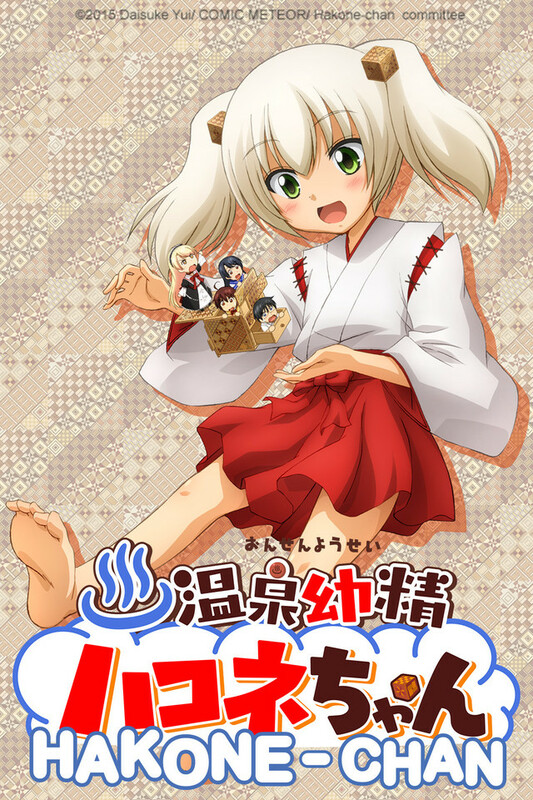 After that, it could be renamed to be "The Hakone-chan Mini-adventures" or something similar. Even when it seems to be starting up a new story line it once again drops it relatively quickly and so throughout you always feel like you're left without any closure. I certainly wouldn't discourage anyone from watching it as it is a very entertaining show; but amusing and entertaining is the only thing I can say positively for it. Cute art, but that's really it. I started watching this show because I saw the cover art and thought it was very cute. When I read the description up here on Crunchyroll I found it very interesting. I've always liked anime with spirits involved. I gave it a shot and was very purplexed. Three minutes.... With the opening three minutes and thirty seconds. I hated that; and yet I couldn't stop watching. Not sure if it was boredom or the fact that I thought it was really cute. It needs a full length anime for sure. This just reminds me of Hetalia which is not much better.